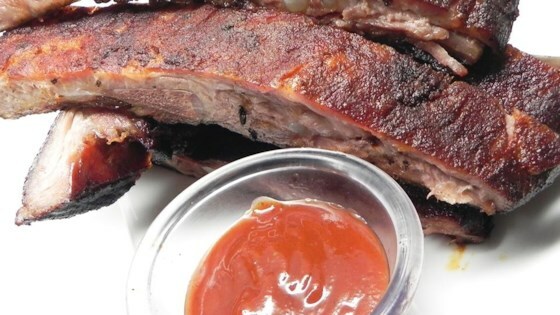 "This is an awesome barbequed rib recipe. You can double or triple the amounts to serve a large group." In a small bowl or jar, mix together chile powder, dried minced garlic, onion powder, cumin, salt and seasoning salt. Place rib roast on a medium baking sheet. Rub vigorously with 1/2 the chile powder mixture. Cover and refrigerate 4 to 6 hours. In a medium saucepan, mix together 1/2 the chile powder mixture, tomato sauce, brown sugar, tomato, Worcestershire sauce, dried onion flakes, soy sauce and water. Cook 3 to 5 hours, stirring occasionally, over low heat. Prepare an outdoor grill for indirect heat. Lightly oil grate. Cook ribs covered on the prepared grill 3 to 5 hours, or to desired doneness. Brush with the sauce mixture from the medium saucepan during the last minutes of cooking. Serve with remaining sauce mixture. Discover the secret to incredibly tender grilled ribs with almost no cleanup. I have never had ribs better than these. Not even in a restaurant! They were tender, juicy and very flavorful. Believe me, they are well worth the time to make them. My family inhaled them! You know, this was good. It was fun making my own grilling sauce for a change. The meat came out really good but not a tangy as I would have thought. Big John, I shamelessly stole your dry rub and adjusted it to make my own. Thank-you, Sir! I liked it. I added more garlic and onion powder. Plus added fresh cracked black pepper all of this is to taste. I also used this on beef back rib and spayed them with apple juice I grilled them. My family loved this recipe. We BBQ year round 3-4 nights a week. This was simple and very good.